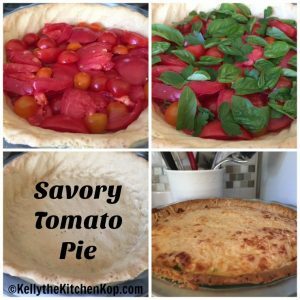 The ingredients below don't have to be exact, this is a forgiving recipe so if you have more or less of anything, or different cheeses on-hand, it'll still turn out delicious! Butter a pie plate and preheat the oven to 400*. Add flour, sugar, and salt into a food processor and blend for a few seconds, then add the cold butter a little at a time. Continue processing until the mixture is crumbly, a couple of minutes. With the food processor still running, add water and vinegar just until well combined. Turn the dough into your buttered pie plate and press it evenly over the bottom and up the sides. Poke it all over with a fork to prevent air bubbles. Bake until lightly golden, about 25-30 minutes. Remove from the oven and lower the temp to 375*. This part is optional because it takes more time (I skipped it), but gives extra flavor: caramelize one sliced onion in 2 Tablespoons butter in a frying pan until golden. Set aside. Mix cream cheese, mayo, mozzarella, onion powder and thyme together. Set aside. First the crushed garlic goes all over the bottom of the baked pie crust. Next layer on however many tomatoes you have. (Reserve a few for the top if you want so it's prettier, but I forgot to do this.) Add the optional onions. Place the basil and parsley on the tomatoes and salt and pepper all over. Spoon the cheese mixture on the top and spread around. Place the reserved tomatoes around the top if you saved some. Sprinkle on the Parmesan. Bake 30 minutes or until golden. If the edges of the crust start to get too brown, throw one of these on, I love that thing!